Today's stage is likely the most intimidating stage of all of them. It's the one that everyone dreads, that we whisper and look at each other with wide eyes, full of worry. Chicopee. Multiple loops. Ski hill. Up and down. For those that don't know, this stage involves 5 loops through a trail setting. What you may not know, is that it takes place at Chicopee Ski Centre. As part of each loop, we must climb up no less than 2 ski hills (one of them being the summit) and then run down them, with some very technical single track trails and boardwalk sections in between. 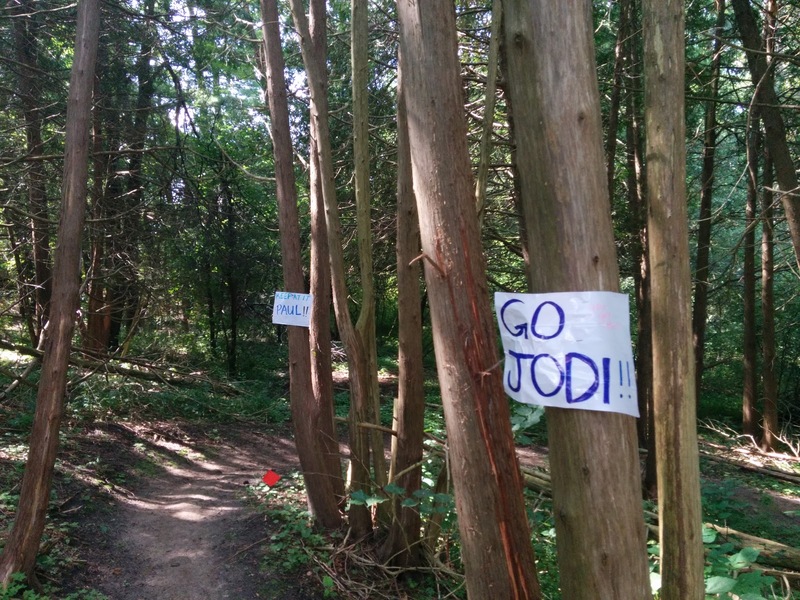 It's a very tough course, with steep hills. As per usual, I was worried about this stage, especially after doing stage 3 (the 30km trail course). It was another course that is a grind, and has many loops to contend with. Also, the footing was much worse than stage 3, with rocks, roots, and raised boardwalks. I was dealing with some GI issues upon waking up this morning; something that I likely ate yesterday was now not agreeing with me. Perhaps it was nerves, perhaps not. In any case, I needed to make sure that I hit the bathroom before the run, otherwise things might have been a bit ugly. About the only thing going for me on this run was the temperature. It was 13 degrees at the start, and the high for the day would only be 20 degrees, with sun and clouds. This is virtually perfect conditions to run this race. In the past, it's been super hot and humid, which makes it much like Stage 3 was; a brutal grind in the heat and humidity. Not so today. My game plan was to power walk the up hill sections, and run as much of the others as I could, especially the downhill portions. Just take it easy, and get through it. After we started the first loop, on the initial uphill climb, I pulled my right Achilles tendon in my heel. Not good I thought to myself. Maybe it was due to the cold, and the standing around before the start, or also the fact that we were ascending the mountain within the first 500 metres of the loop. No time to warm up. In any case, I was immediately concerned that it would (a) hamper me on this run, and (b) get worse and cause me to drop out altogether. The rest of the loop was spent getting to know the course, since it had changed a bit since last year, and making sure my ankle wasn't getting aggravated. My sign is there in the distance. 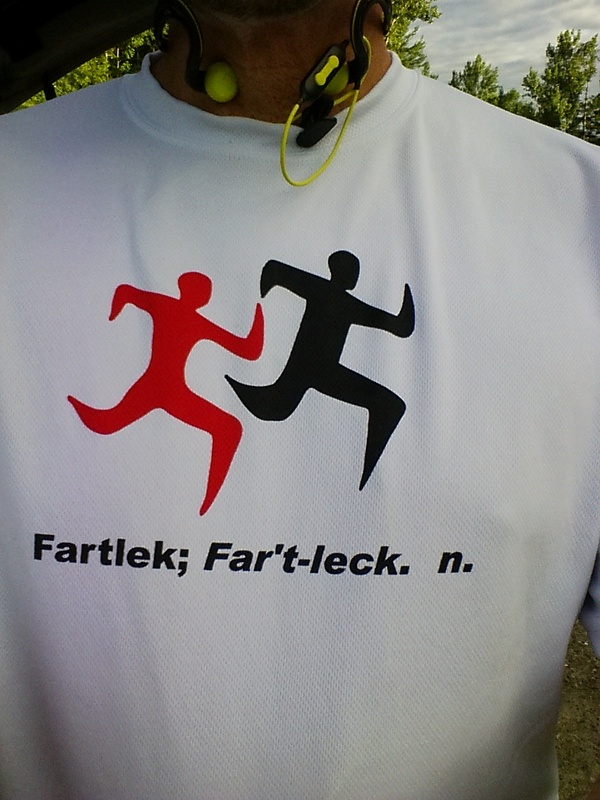 Rocking the Flying Fartlek shirt for Jim. This stage also holds special meaning to me for other reasons. It's the stage my friend the late Jim Simpson ran twice in the past. He passed away last October from cancer of the throat and liver, and each year I run this stage in his honour wearing our team Flying Fartlek shirt. 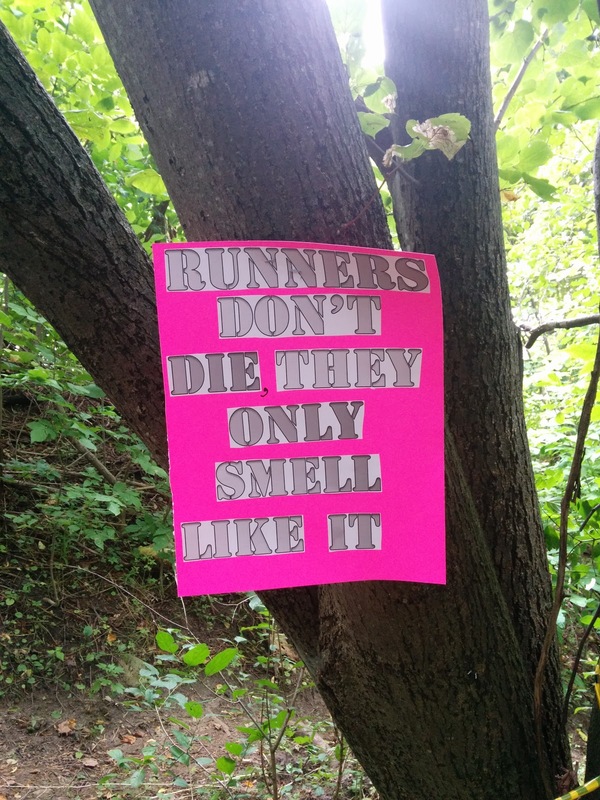 He was an extremely dedicated runner, and also dedicated to our little group that met up semi-regularly and ran through Scarborough and Pickering. It seemed fitting that I could try and represent his spirit on this tough stage. At the start of the second loop, the discomfort in my heel diminished to the point where I couldn't feel it any more, and I started to enjoy my run. I ran smart; power walking up the steep hills, and running everywhere else I could. I knew my time would be mediocre but it was all about finishing. I knew I hadn't trained on enough hills or trails to really run this stage well. In Stage 3, I also started to catch other runners and pass them. One of them I leapfrogged for 2 stages, until I made my move and went on ahead. Again, no real reason to do so, I would have been happy to just run along with them, but I was feeling pretty good, so I went ahead. Stages 4 and 5 were unremarkable, more of the same as stage 3. I managed to stay the course, walk the ups, run the downs and everything else, and take the odd walk break here and there, when I needed to. At one point, close to the end of the last loop, I almost went over and rolled my left ankle. Luckily I managed to not put all my weight on it, and come out with it being a bit sore but nothing serious. Coming into the finish on the final stage, I opened my pace up and sprinted into the finish. The hardest (at least in my mind) stage was now complete; just the 10km time trial, and the full marathon were left.